The biceps curl is often paired with the overhead press. Biceps curl to overhead press is a complex activity that mixes two common strength training exercises into one. Because it combines two exercises, it requires contribution from a number of muscle groups in your upper body. Perform the exercise with a pair of dumbbells. The exercise can be completed while standing or sitting. To perform biceps curl to overhead, hold a pair of dumbbells in your hands and allow your arms to hang down by your sides with your palms facing forward. 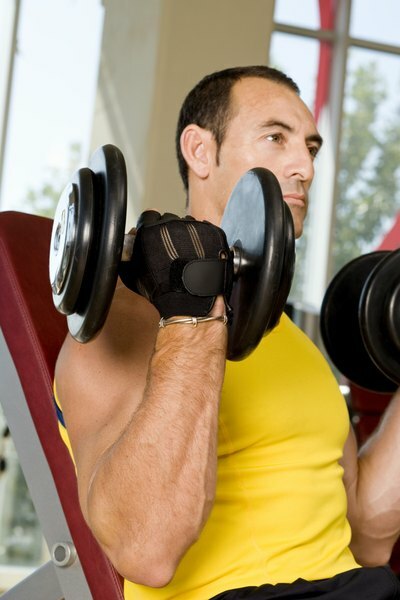 Keep your elbows close to your torso and bend them to bring the dumbbells up to your shoulders. Rotate your wrists so that your palms face forward. Push the weights up over your head, finishing with your arms fully extended. Lower the weights down to your shoulders, then rotate your wrists again so palms face inward. Extend your elbows to lower the weights back down to your thighs. According to ExRx.net, the biceps curl component of the exercise primarily develops the biceps brachii muscle at the front of your upper arms. Also contributing to the movement are the brachialis and brachioradialis of the arms, which assist with elbow flexion. To perform the overhead press component of the exercise, your deltoids -- the major muscles in your shoulders -- are responsible for most of the force development. Your triceps, located at the back of your upper arms, contract to extend your elbows as you press the weights overhead. Incorporating biceps curl and overhead press into one exercise allows you to quickly target most of the major muscles in the arms. This is an effective activity to incorporate into your regimen if you’re pressed for time in a workout. Those looking to significantly develop muscle mass or strength may benefit from separating the movements back into two separate exercises. Lifters may normally use a higher weight when performing overhead press than they would with biceps curl. However, they’re forced to go with a lighter weight so that the biceps curl component can be completed. In addition, the exercise can only be performed while using separate weighted implements such as dumbbells or kettlebells. You’re unable to twist your wrists to go from biceps curl to overhead press when using a barbell. Biceps curl to overhead press can be incorporated into your strength-training workout, which is completed two to three days per week. Allow your biceps, triceps and deltoids 48-hours of rest in between each session, such as with a Monday-Wednesday-Friday schedule. Complete three to five sets of 10 to 15 repetitions. To increase difficulty, add an element of instability to the exercise by performing it while standing atop a balance trainer ball. 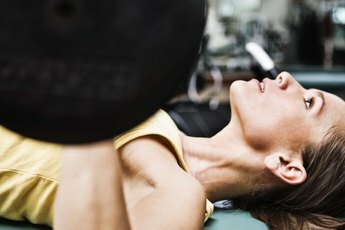 Do Pushups Work the Rear Delts? 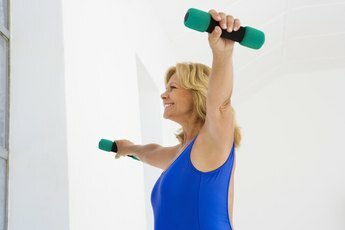 What Muscles Do Butterfly Exercises Work?